The Minister of Information and Culture, Alhaji Lai Mohammed, has urged the media to galvanize support among the populace for the war on terrorism, which he described as a major challenge facing the nation. ”The war against terrorism is not a war for the military alone but for all Nigerians. The media must reflect this in their reporting and galvanize the people to know that it is not just a battle against a few insurgents but a war for the very survival of our nation,” the Minister said when he met representatives of media professional bodies in Abuja on Friday. He said it is important for the media to report the fact that the military has turned the tide against the insurgents, degrading their ability to carry out spectacular attacks and retaking captured territories, ”thus paving the way for displaced persons to gradually return to their homes, for schools that have been destroyed to be rebuilt and for pupils who could not go to school to do so”. 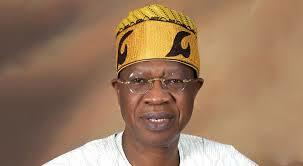 Alhaji Mohammed also stressed the need for the media ”not to remain on the fence” over the issue of national unity. ”Apart from the challenge of terrorism, there is also the issue of national unity. If anything, we have taken our unity for granted and have not made a conscious and concerted effort to constantly service and strengthen it. ”Unfortunately, what started as a crack is now widening into a gorge. The media must not remain on the fence when the issue of our national unity is involved. They must carry out their duties in such a way that will unite, rather than divide our people. Our unity is fragile, and the fragility comes into the open at a time of economic downturn as we have now. We cannot afford to be neutral on the issue of national unity,” he said. The Minister assured that the government would work with the media in the interest of the country. ”For example, we are working on forging a partnership between the government and the media that will see military and intelligence chiefs interfacing with you to give you first hand information on the progress of the war against terrorism. ”We believe it is important to carry the media along, because if you are well informed about the war, you will be in a better position to inform Nigerians about it. In this regard, you will hear more from us in the days to come,” he said. Alhaji Mohammed assured that under his watch, the Ministry of Information and Culture will ensure that the media get timely and accurate information from the government, saying ”if you run into any roadblock while seeking information from any government establishment, kindly notify us”. He hailed the media for effectively playing their watchdog role during the last elections that saw the opposition ousting the ruling party for the first time in the history of our country. ”Whereas a few media establishments fell short during the last elections, jettisoning professionalism on the altar of political expediency, the media largely availed themselves creditably by maintaining their professional integrity,” the Minister said.